10 years running, Taco Pete has valued itself not only on the precious food you keep coming back for, but also the sense of community that we like to call family. 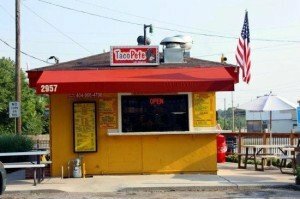 10 Great Years of Taco Pete! Stemming from the foundation the first Mr. Pete created handed down to his son; family has always been a huge part of the business. Today it continues, not only being family owned and run, but also with you, our customers. This family is created each time you step up to the window and with every call in. It is continually developed through the conversations and laughs you have either at the window, on the phone, or when the crazy crowd slows down and someone comes outside to talk. With this year being our 10th year of business, we realize none of this would be possible without our community, our family, supporting us each step of the way. Throughout these 10 years we have listened to your wants, evolved our menu, and created needs. These mouthwatering needs include the amazing shrimp and steak tacos, burritos, and quesadillas, our always fresh and flavorful wings, and an always yearning need to conquer a sweet tooth with an always homemade sweet potato pie. As we continue on this road to another 10 years, we hope for many changes to happen as we go along. What are those changes you may ask? Well you better ask yourself because some of our best changes come from your cries for more delicious food and future ones may even stem from your cry for a little more elbowroom. With that said, to see what changes are to come, you’ll just have to stick around to see. Thank you Taco Pete family for the amazing 10 years we have been here and for many more to come. 10 Great Years of Taco Pete, and let’s keep going! ← Why isn’t Taco Pete as fast as a fast food restaurant?